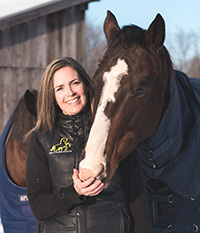 As an active participant and coach in the equestrian world, Erin has learned how important a chiropractic care plan can be. The relief provided by regular visits has enabled her to continue pursuing her lifelong enjoyment of riding and caring for horses. Erin was a patient of Restorative Health before joining the team in early 2017. Erin and her husband purchased a farm and moved to the Smiths Falls area in the spring of 2015. When not in the clinic she can be found outside horse-back riding or walking her 3 dogs. Dr. Cordick explains everything in such an amazing way. She is a great teacher and was able to help me understand what I need to work on. The staff are super friendly and organized. I'll be bringing my whole family here. It does not get any better than this! After one treatment, I have already noticed a significant improvement in the level of discomfort I have been experiencing due to an injury I sustained after a fall skating on the canal last Feb. I appreciated the time Christine took during my initial visit to listen to my concerns and to explain how she might be able to help me. I like how she is offering a combination of adjustments and exercises I can do at home. I look forward to continuing to work together to improve my health. Very thorough and I didn't feel at all rushed. This was my first visit and I was very pleased with the professionalism and that they respected my time. I find the staff to be very friendly, professional and accommodating. Christine takes time to teach about posture and fixing recurring problems with great explanations and patience! Really happy with how my first appointment went and surprised at how well my problem feels after only one appointment. Very pleasant atmosphere and friendly, I felt welcome from the moment I walked in. Happy that the office is in Perth - very convenient AND I came away VERY confident in the care and treatment that I will receive here. "I felt like I was important. Not just another patient." I felt so much better immediately after my first treatment it was wonderful. I came with high expectations, and those were surpassed. Absolutely wonderful experiences, both at my initial visit (home visit), and my first visit at the office. The difference I felt after each visit was astounding! I really value the home stretches and explanations from Dr. Cordick, as well. Always a wonderful experience with a great atmosphere. Always leave confident about the care received. Dr Cordick was very knowledgeable and I felt confident that my physical issues could be resolved over time. I felt very welcome from the moment I was greeted by Tina to my consultation with the Doctor. Dr was very gentle. And very respectful. I felt comfortable. As I had always used a female Dr. Nice overall day. I never realized how much better you can feel with chiropractic care until I started going to appointments a couple years ago. The results are great and I plan to keep going for years to come. Really appreciated the extra effort made so I could be seen the very day I called. Thank you. Dr. Cordick is always so friendly and makes you feel at ease immediately. She explains things clearly and I know I am in good hands!